In this post, I will once again speculate on what we might see coming up in season three, based on available interviews and other tidbits of information. If this sounds a bit too spoilery for you, read no further! Yesterday, we finally saw the Collider interview with Joanne Whalley that had been teased ever since all those set visit stories and interviews were published last week (I have yet to see an extensive interview with Whalley anywhere else). As with everything else we’ve seen over the last week, including the two trailers, you have to wonder about the amount of information they’re giving away, either explicitly or in the form of disparate details that anyone who so wishes can piece together into what are possibly major plot developments. Before reading the Whalley interview, we had already been teased that Matt’s relationship with Sister Maggie might not be exactly what comics fans would expect. This could mean that they do not share the biological bond we know from the comics, where Maggie turns out to Matt’s mother. At the time, this was a clever retcon by Frank Miller from the Born Again storyline, pencilled by David Mazzucchelli, since Matt’s mother had been presumed dead up until that point. While little is known about Maggie’s own story, another pice of the puzzle was added quite recently, in a story by Mark Waid and Javier Rodríguez, which gave us a pretty satisfactory explanation for why Maggie felt compelled to leave her family. 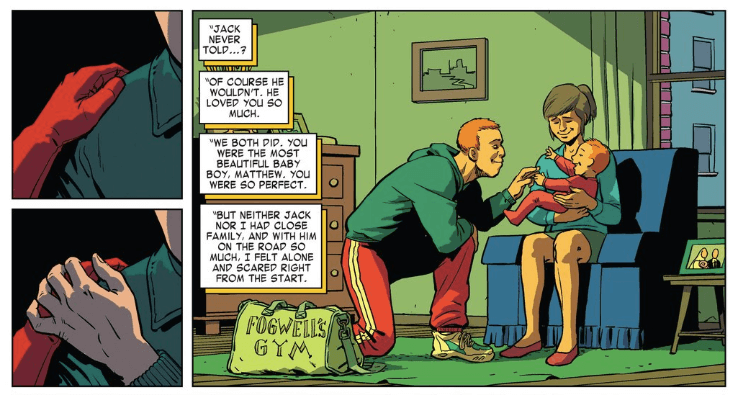 In the “Original Sin” storyline from Daredevil #6 and #7 (vol 4), by Mark Waid and Javier Rodríguez, we learn that Maggie left the family for fear of hurting young Matt after she developed a serious case of post-partum depression (or even psychosis). In the interview linked above, we learn that Matt actually grew up in Maggie’s care since she runs the home (I refuse to use the outdated term orphanage…) where he grew up after Jack’s death. This means that Maggie is known to him, and that she, regardless of their biological relationship, has been a mother figure to him. Since the choice to have Jack die while Matt is still young raises all kinds of questions about what happened in Matt’s life between Stick’s abandonment and his meeting Foggy in law school, I find it comforting to know that he had people in his life that were some kind of steady presence. We also learn all kinds of other things that I know many of us had been wondering about, such as the role (if any) Father Lantom would play in this coming season. It turns out that he’s instrumental in getting Matt to Sister Maggie (though who delivered Matt to Father Lantom remains unknown to the many of us who don’t belong to the lucky few who have seen the first few episodes. (Lest you forget, the review embargo lifts on Friday, so expect an additional onslaught of information, even though early reviewers are usually instructed to not give away too much.) What seems clear is that both Father Lantom and Sister Maggie will be important this season, beyond their ties to Matt. Matt and Maggie in a promo still from season three. This particular image was “borrowed” from ManWithotFear.com’s excellent page collecting all the news on season three. One thing you have to wonder about going into season three is whether the glimpses into Matt’s history that were introduced in seasons one and two will be addressed in the story we’re about to see. One scene that stood out to me right off the bat was the one in the second episode of season one, when Jack is making arrangements for Matt in case he ends up dead after his final match. He calls a woman, presumably Matt’s mother, and leaves a message on her answering machine. The only thing is, the outgoing message on the machine doesn’t sound like what you’d expect from a nun living in a convent. If Matt’s mom is someone other than Maggie (and this has been planned since season one somehow), then what is the connection between her and the convent? And what exactly have they been planning? 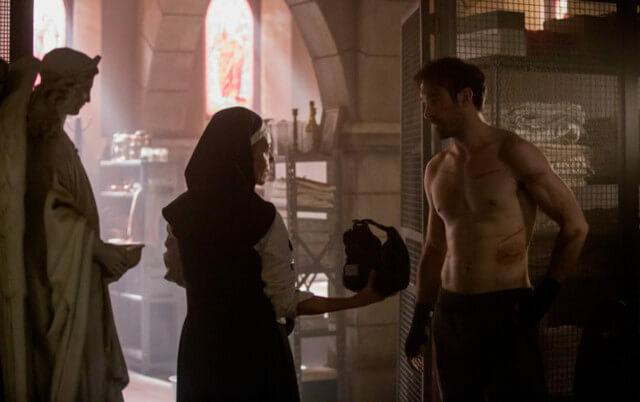 There’s also a scene from the third episode of season two (see the teaser image) where Matt, knocked unconscious by Frank Castle, seems to remember being cared for by a nun that we all figured had to be Sister Maggie. What is interesting about the environment in which this seems to take place is that it looks a lot more like the images we’ve been teased from season three than the hospital Matt landed in after his accident. You might wonder why this matters, especially if you’ve discovered the character through the Netflix show, as opposed to the comics. In Born Again, it’s clear that Matt receives a visit from Sister Maggie while he’s still in the hospital. She also, somewhat mysteriously, seems to know what Matt is going through, and that he’s developed some kind of new gift. 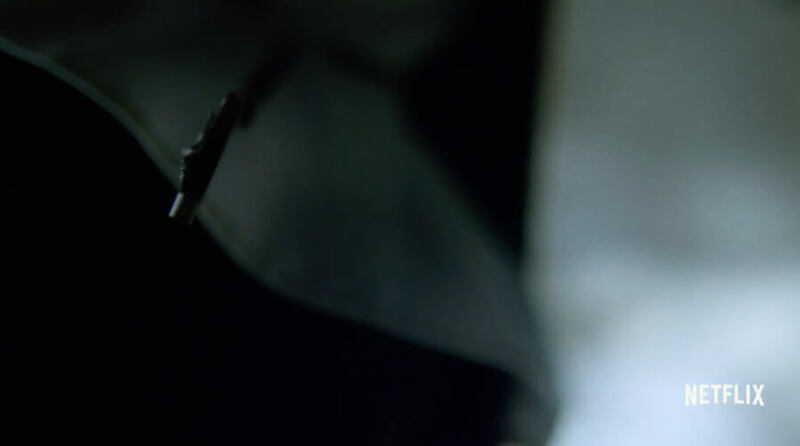 Looking at the show, it is clear that the scene from season two takes place some time later, presumably after he came to live with her and the other nuns. You can always hope that the clues they leave over the course of a show like this line up in the end, but I’m always impressed when they actually do. Especially since something as basic as how much time has passed since Matt and Foggy finished law school is completely different between seasons one and two. Well, I’m going to hand over all the speculating to you guys now. For those of you who are curious to learn even more about Matt and Maggie’s relationship on the show, a scene from season one featuring the two was among the clips shown to attendees at NYCC. You can read descriptions of it here (Bleeding Cool) and here (Comicbook.com). And going off Oleson’s remarks, it’s hard to tell if we’ll get an explanation for how Matt survived Midland Circle or not, given the need to get going with the main story. I puzzled over the answering machine message in season 1 for a while until I remembered my dear colleague who was a nun. I didn’t know she was a nun until we’d been teaching for a couple of years together at uni. She wore slacks to work and had a mobile phone (and a phd!). She lived in a small convent, but would travel and socialise quite normally. In short, I think the notion of the pious, Luddite nun isn’t strictly true.